When you're a die-hard mayo girl like I am, and ALL the store bought mayonnaise is full of disgusting soybean oil plus other frightful ingredients, what do you do? First, click here to learn how to make homemade mayonnaise, and then I'll show you my variations: Finally – homemade mayo that tastes great! 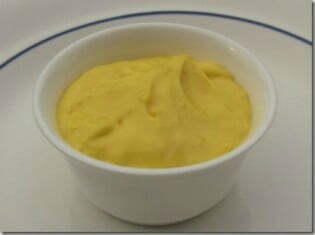 Original Homemade Aioli – See the above recipe link. For mine this time I used apple cider vinegar to get the flavor as close as I could to what my guests would be used to in store bought mayo. The range in the recipe says 1/2 to 1 Tablespoon vinegar, and I used 1/2 Tablespoon so it was mild. Citrus Herb Homemade Aioli – Make the original mayo using fresh lemon juice (instead of ACV as mentioned above), and I also used an orange infused oliveoil. If you can't find it, just use whatever oil you like in your mayo and also squeeze in a little lime and/or orange juice. Mix together 1/2 cup of this mayo with your herbs of choice. I used fresh chopped parsley and oregano in mine. For all of the above spices, feel free to add more to your taste, but some people are so finicky about anything spicy that you have to be careful if you're entertaining. I like it to have a nice flavorful bite so I added more of all three! You'll also love this Ancho-chile Lime Mayo and this Garlic Aioli. 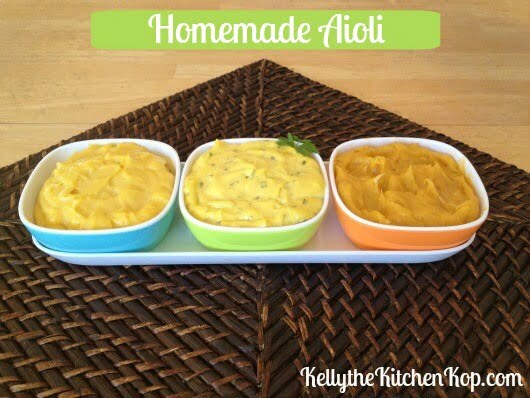 What to do with your Homemade Aioli?! Dip homemade fries in it, spread it on homemade sub sandwiches, or use it as a potato chip dip! Let me know if you try any of these and what you think! Or if you have your own fun variations, please share! Just want to buy some? If you just don't think you would make homemade mayo, or sometimes need a quicker option, here's the only jar of mayo I buy in a pinch. I use half melted coconut oil and half olive oil. It gives it a lighter flavor and also helps to thicken it as it gets colder in the fridge. I add whey and it last 2 weeks in the fridge! @ Trina Peruski O’Boyle – Mine lasts at least a couple weeks, if you add whey, it helps it keep longer. Also, you could make half a batch! I’ve always wanted to make my own mayo but afraid that there will be a lot of waste since it will only last at the most 5 days in the fridge. Thanks! I stopped making mayo because I would having a breakdown when it wouldn’t set! Grrr! Talk about frustrating! I’m gonna give your techniques a try. Hi Kelly, I have been making homemade mayo for years. I was crushed the other day when my husband came home and said he just doesn’t like it. I was not crushed over the critique but it is one more thing to figure out. I thought I had that one done! Change is good though, keeps things lively. Very well timed post, thank you for sharing. Side question if I may…if you feel like you are fighting off a bug do you take extra doses of cod liver oil or just the WAPF dose? Thank you! AND try adding a little more sugar. Again, that’s not ideal, but better than store bought! Also, maybe he’d like it if you added herbs or spices like in this post? Those two work EVERY time for us. Either nothing comes of the symptoms we felt coming on, or it’s super short-lived and mild. I’m using 1/2 olive oil and 1/2 coconut oil in my recipe. With the coconut oil it always thickens and it cuts the strong olive oil taste. I love homemade mayo! I like to put a dash of smoked paprika in my mayo. Yum yum! I finally got it to where I can make a mayonnaise every time. I used to always break them, but I think finding patience and reducing my anxiety has really helped. Okay, I’ve been a reader for several years now, and I wanted to put your “mayo posts” into my “how to REALLY make the recipes from NT” notebook. I can’t believe that this is the first time I’ve used the “print” feature that you put at the top of your posts, but I love it. Just wanted to shout out a little love for easy-to-print blog posts, cuz I sure have some ugly notes in my notebook; thanks for the efforts that you put into your blog to make it so user-friendly! I wondered if anyone ever uses that “print this” feature, thanks for your feedback! I loved the strong olive oil flavor in my homemade mayonnaise. But that was years ago. It was so good I ate it like ice cream. Not practical for everyday. What I use now is Vegenaise. Vegenaise with the purple cap is made with grapeseed oil. That works well enough. But now I’ve got to try these recipes. I’ll probably eat them in one go for dessert. Kelly, have you tried Crestwick Farms deli ham, chicken, and bologna slices? It’s the only lunch meat I buy now! I’ve had the ham and bologna (we love them) but not the chicken, I’ll have to try that one! I made mayo and the process was so cool! I hated the strong taste of olive oil, though. I need to try the melted butter next time. first of all, my condolences (fans of Hellman’s-type flavor mayo don’t consider that mayo, so we tongue-in-cheek have fun with MW fans at our house; I bet Kelly’s laughing with me! ), but honestly, I think the biggest difference is how sweet it is. Also, MW has little red flecks in it… dash of paprika, perhaps? Anyway, if I had a MW fan in my house, I would experiment with the mildest of vinegars I could find, maybe even a sweet one (we got some blood-orange vinegar when we were in Sonoma a few years ago, but maybe even balsmic would lend towards the desired flavor). The trick is to try lots of combinations and ask him to be patient while you try to find a reasonably-close but much better for him substitute. Try sweetening with warmed honey, various different spices–maybe some finely-ground allspice? Oooh, the possibilities!–different vinegars and the mildest oils (melted butter is a new one to me!) you can. Good idea to play around with some more mild-tasting or sweeter vinegars. Or just use *less* of it. And yeah, do NOT use icky Canola. That stuff is nasty. My hubby hates the taste of mayo but likes miracle whip. Is there a way to make mayo taste more like Miracle Whip? I’m so glad you posted this! I loved your recipe. But I went on a low oxalates diet so I needed to substitute the sesame oil but I had tried other oils and never liked the taste. My daughter taught me how to make salad dressing using melted butter and it was amazing. Then it hit me I could use melted butter as one of my oils in the Mayo. And it worked perfect and it ended up being the best Mayo I have ever tasted. I still use some sesame oil for my family’s Mayo and for mine I use olive oil. Thanks so much for your great posts!! It wasn’t just the color though, it was the consistency that got a little funny. Maybe the red pepper flakes “bled”? My garlic powder is yellow in color and yellow and red mixed becomes orange. Maybe that’s why that mayo looks like squash puree?